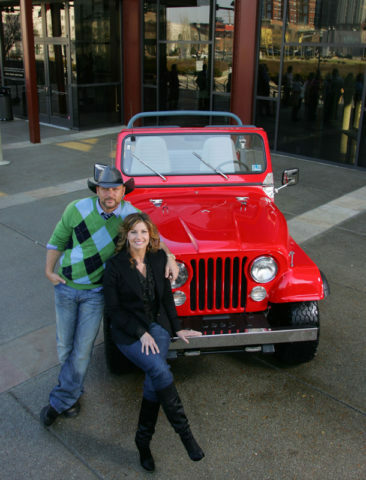 Who knew that a little ‘ol red Jeep would play such a big role in Tim and Faith’s life? In case you didn’t know, the red Jeep (a 1978 CJ-6) that Tim and Faith borrowed and drove a few times when they were dating was later found by Faith and then given to him as a gift — years after they were married. Today, that very same Jeep plays a role in both their personal lives and their professional lives as well. Let’s start with how Jeep has played a role in their professional life. It’s no secret that Jeep was the sponsor for their 2007 Soul2Soul tour. Tim and Faith even announced their tour plans while standing next to that red Jeep CJ outside of the Country Music Hall of Fame in Nashville. Their “date Jeep” actually traveled with them on their 2007 Soul2Soul tour. A special “Soul2Soul” 2007 Jeep Wrangler Unlimited Rubicon was also incorporated into tour itself and later auctioned off on eBay. And on a related note, Tim McGraw performed live at Camp Jeep that year. Wondering how the Jeep pictured above has played a role in their personal life? These days, Tim and Faith actually have a couple of Jeeps, but they mostly enjoy riding around their Nashville farm in that 1978 red Jeep CJ. Tim uses it to get around the farm, especially when he’s hunting quail and pheasant. And every year on their wedding anniversary (October 6, 1996), Tim and Faith have made it a tradition to ride around the farm in their ’78 Jeep. Yep… It’s a Jeep thing! Tim McGraw Likes Jeeps… and Dogs!